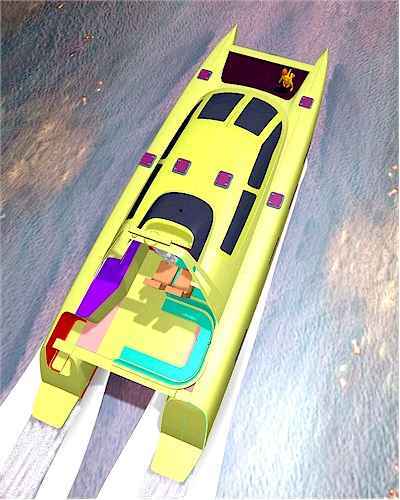 These low-drag powerboats give a much better ride and require far less power than other types for target speeds of up to 2.5 to 3.0 times the vessel's hull speed. Excellent economy, a superior ride, and a more extensive cruising range are possible with these displacement multihulls. 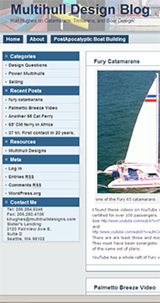 Some of those catamaran powerboats are simply regular single hull powercats with the middle of the hull chopped out. While that may be slightly better than the single-hulled boat, it is still not quite right. Multihull powerboaters need to be able to take advantage of our fresh look at what the problems really are and what the best solution might be. Often by taking what we know about low drag hulls for sailboats, and applying it to power boats, a better power multihull results. See this article on displacement powercats. If higher speed is desired, then planing hulls become the better choice. Many of the cats can use either displacement or planing hulls depending on the speed to be optimized.